Well I never! My blog is five years old this week! Time certainly flies when you're having fun. Ha! Pretty scary eh?! 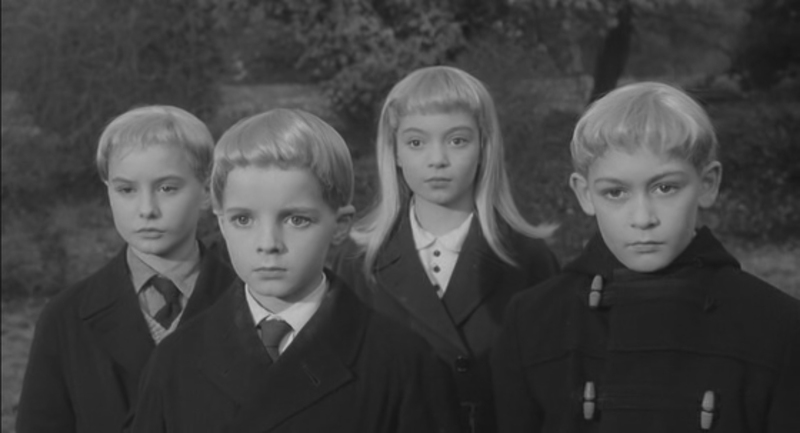 If only they were casting for Village of the Damned that day, I could have bagged myself a starring role…. Sorry, I digress… I have fond memories of writing my very first post, which featured a lovely, but stiff-as-a-board Colette Sencha top. I may not have got much wear out of it (the higher than average neckline always made me feel like I was being slowly strangled), but it taught me a lot about sewing, fitting and, above all, fabric choice! Having a blog isn't just about making things and taking photos. It's also about interacting with the sewing community and for me, that's been by far the best thing that's happened since I started writing it. I've learnt lots about sewing during my first five years and I still have a long way to go. More importantly, I've met some of the kindest, most talented and generous people ever. And the funniest… I've been on some meet-ups where I haven't stopped laughing the entire time! In short, sewing and writing a blog have made me very happy and kept me sane - you can't ask for more really! I'm sure you're aware by now that Girl Charlee recently set up a UK branch and have been spreading the word about their awesome knit fabrics throughout the land. They contacted me a while back to see if I'd like to try out something from their range and I was more than happy to oblige! They have a really interesting selection to choose from, including some lovely ponte de roma knits and cotton jerseys. I finally settled on two of their cotton jersey gingham prints in Paloma Grey and Classic Blue. I chose gingham as it's midway between a solid colour and a busy pattern, plus it's a nice change from stripes. 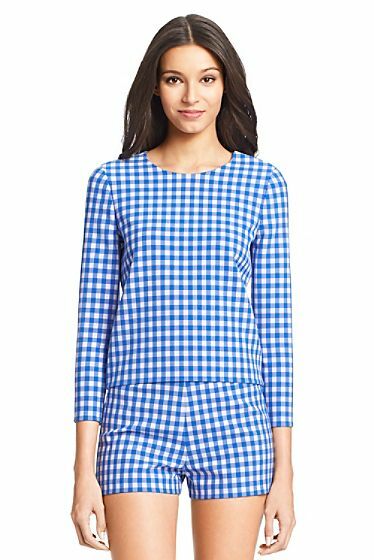 My original inspiration was this picture of a simple Diane Von Furstenberg top from my Gingham Pinterest board, not the matching shorts though! I decided to pair the fabric with the Tilly and the Buttons Agnes top, which Tilly very kindly gifted me when it was first released. The fabric is a nice quality cotton T-shirt fabric from the Modern Air Collection. It has 25% stretch and good recovery and the cotton content gives it a bit of stability so it doesn't misbehave and curl up all over the place. It's also quite wide (142cm), so I only needed a metre to make the top. I chose the plain neckline and arm options - I thought the ruched neckline would get a bit lost amidst all that gingham and ruched arms are just not really my style. Based on reviewer feedback on the tight fit of this pattern, I cut a size 5 all over, which is one size larger than I'd usually sew for a TATB pattern. This was deliberate - the Agnes top is designed to be very close fitting but I didn't want mine to turn out absolutely skin tight and look like a leotard! The fit wasn't bad, but I needed to make a few tweaks to the hips and shoulders, next time I'll grade down to a size 4 in both those areas. Once I'd cut the fabric out, it only took me one episode of Desert Island Discs to sew it up on the overlocker. I then changed to my regular sewing machine and finished the neckband, sleeves and hem with a double needle. I took 2cms off the length of the full length sleeves (T-Rex arms) and that was it! But let's back peddle a bit, at the beginning of this post I mentioned that I'd received two gingham prints - grey and royal blue - so what did I do with the grey? 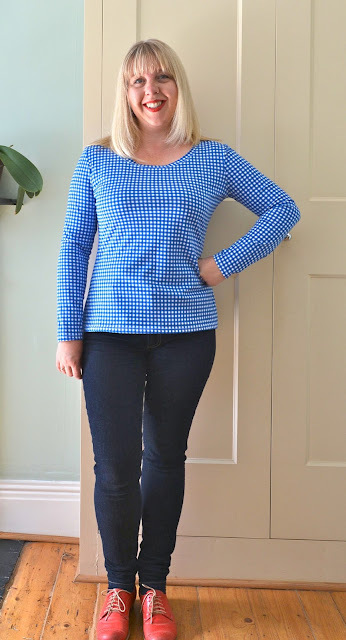 Well I actually had the same intention for the grey gingham, which was to make an Agnes top. At the eleventh hour though, I rashly decided to abandon my original plan and make an Agnes dress instead (with 1.5m I had just enough fabric). I used this tutorial from Tilly's blog to make it, but used the half circle skirt from the Lady Skater dress instead of the gathered rectangle from the tutorial. Alas, once I'd sewn it up, I realised it was very much a summer dress - I think this was because of the colour. I chose the grey because it looked like charcoal grey on the website, whereas in reality it has a much lighter tone, more like a dove grey. And when seen as a whole dress (rather than a top), it was just far too light and summery to wear in autumn. So I've decided to save it for next summer instead - I haven't finished the hem and the arms yet, so I may well end up making it short sleeved. For what it's worth, the Classic Blue gingham is exactly the colour as it appears on the website - a bright, royal blue. So I did get two garments out of my fabric in the end: one to wear now and one to save for next summer. I really like the top - it's already proving useful in this in-between weather. It's a close fit, but still comfortable and the cotton jersey feels lovely to wear. I've worn it a few times already - with jeans (see above) and with a cardigan and red denim skirt. If you'd like to try out some Girl Charlee fabric of your own then you're in luck as they're very generously offering one winner two metres of their choice of fabric! Hoorah! To enter, simply leave a comment on this post telling me which Girl Charlee fabric you'd choose if you're the winner. The full range can be found in their online shop here. The giveaway is open worldwide and closes at midnight GMT on Sunday 4th October. The winner will be chosen at random. Please make sure you leave your email address if it's not linked to your Blogger profile so I can contact you if you're the winner. British Sewing Awards 2015 - vote for me! 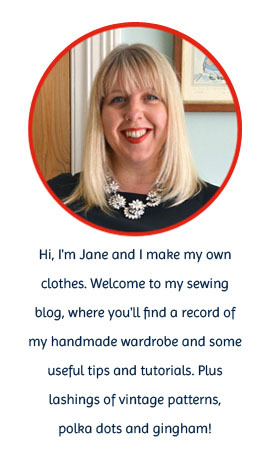 Exciting news alert….Handmade Jane has been nominated in the Best Sewing Blog category of the British Sewing Awards 2015!! Whaaaaaat??!! Yes, I couldn't believe it either! The competition is fierce in the Best Sewing Blog category, so I'm not expecting miracles, I'm just delighted to have been nominated. But, if you enjoy reading my blog and would like to cast a vote my way, then I'll love you forever! You can vote online here or via the button in the sidebar. 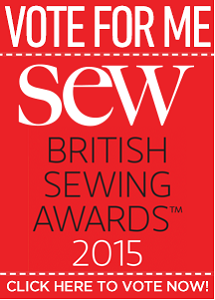 There will also be voting forms in the November and December issues of Sew Magazine, who run the awards. I promise faithfully not to spam you with voting requests ten times a day - I'm terribly British like that! After today I won't mention it, (well maybe a tiny reminder in December!) If you do take the trouble to vote - thank you very much in advance. And what a fab weekend it was! On Friday I went along to the Handmade Fair at Hampton Court - this is on my side of London, so an easy one for me to get to. I was delighted to hook up with Jenny from Cashmerette and her lovely mum almost as soon as I walked through the door and we were joined a bit later by Rachel from House of Pinheiro. Look at the ridiculous differences in height - remind me to take a box to stand on next time! I really should have booked into a workshop or gone to see a demonstration, instead I spent most of my time eating, drinking tea and chatting, I have no regrets. I still managed to pick up some lovely pieces of fabric from the fabulous shopping village. All of them are very summery and totally inappropriate for winter sewing - I'm sensible like that! 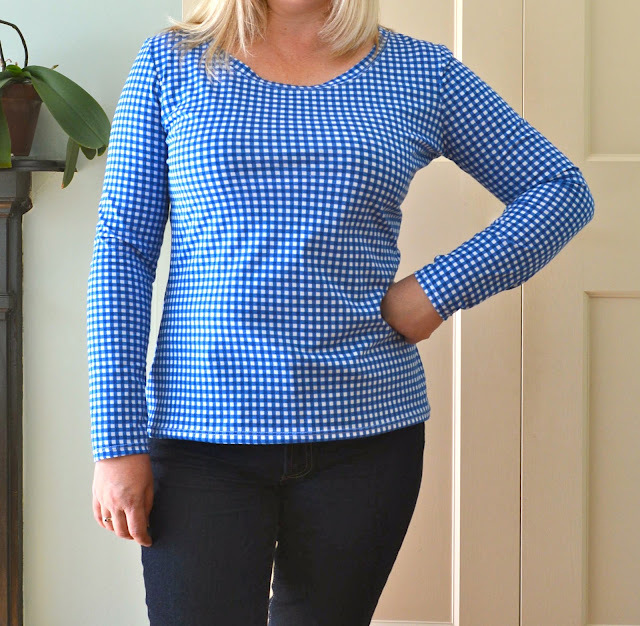 The top piece is a length of vintage gingham from Simply Vintage Designs. This stand was a complete treasure trove and I spent ages rummaging around. The other two fabrics are vintage chambrays from the Fabric Godmother which I can't wait to sew into cool, summery shirts. 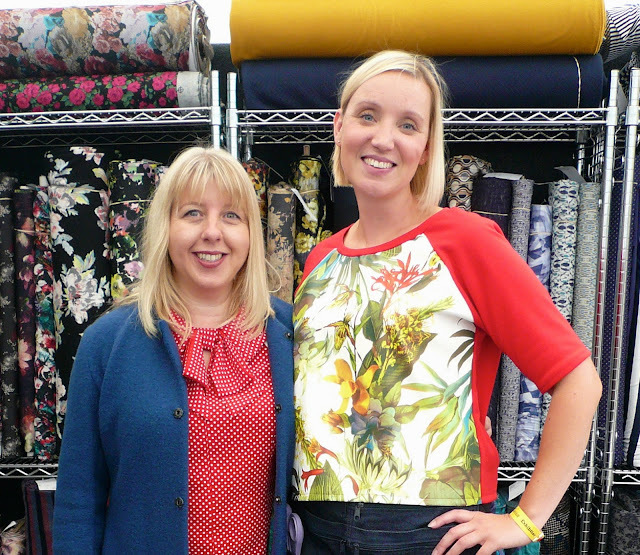 Despite drooling over her fabrics for years, I'd never actually met Josie from Fabric Godmother in person, so it was lovely to have a quick chat with her. I might have to make a direct copy of her Linden sweatshirt! My pledge for next year is to arrive super early and have a thorough look round the stands before I get distracted! It's probably just as well I didn't have more time this year as there were some seriously talented makers exhibiting. The fun didn't stop there though. On Sunday I legged it over to Islington with Winnie from Scruffy Badger Time to attend a one day Trouser Fitting course at Ray Stitch. Ah I'd been looking forward to this course for ages and it didn't disappoint. It was based on the same principles as the pattern cutting weekend I blogged about here, where we made bodice and skirt blocks based on our measurements. Our teacher - Alice Prier - is extremely knowledgeable about pattern cutting and was a great advert for the course in her perfectly fitted trousers! She'd also brought along several pairs of her own trousers to show different ways of finishing waistbands etc. This gave me lots of ideas for trouser construction, my favourite being the hidden elastic waistband! …and smiling, yay they look like trousers! The aim of the course is to create a basic trouser block that can then be used on its own and/or as a starting point to adapt other trouser patterns. After taking measurements, working out our front and back pattern pieces and sewing them in calico, in no time at all we each had a pair of trousers to try on. I don't have any photos of my own toile (I'm useless, sorry! ), but I can tell you that the fit wasn't too bad at all for a first attempt. I had to take a wedge out of the back thigh as there was a bit of excess fabric, and add an extra wedge to the top of my back piece to accommodate the curves around my 'ahem' arse area. The trouser block was for quite a straight leg so I also made amendments to the pattern for a narrower fit as that's the style I think works best on me. I'll be making my first trousers using my new block very soon and I promise to take lots of photos this time. Have you seen the September issue of Love Sewing? If you have, you may have noticed a rather splendid looking tutorial for a Tooth Fairy Cushion - by ME!!! I'm so excited to see my work featured in such a great sewing magazine! I first posted about these cushions here when I started selling my work at craft fairs. Since then I've received countless emails from readers asking if I can put together a tutorial, so that's what I've done! There's limited space in magazines to print every single step-by-step photograph, so this is a good opportunity to include a few extra ones here on the blog. 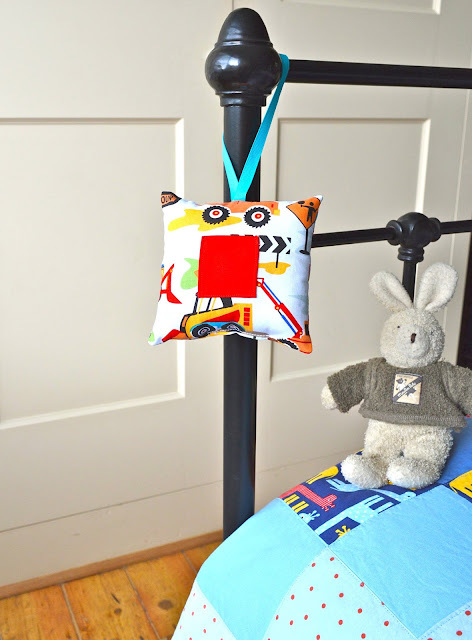 These little cushions were always a best seller at craft fairs - they’re an ideal gift for both boys and girls and make great keepsakes. Tooth fairy cushions are the perfect place for children to keep their teeth safe until the fairy pays a visit! Once the precious tooth is safely stored in the front pocket, they can be hung from a bedpost or door handle. This makes it much easier for the fairy to retrieve the tooth and leave a reward without waking the child! *Fabrics used are Periwinkle Fairies and Dig It, both by Michael Miller and available from Sew Scrumptious Fabrics. The front and back pieces don’t have to be exactly the same design. Just make sure that on the front piece, there’s an obvious space or gap in the middle of the design for the pocket. 1.We’ll start by making the pocket. With the right side facing you, fold the top edge of the pocket square to the outside by about 0.7cm and press. Using a 0.5cm seam allowance, sew down one edge, across the bottom and up the opposite side (don’t sew across the top). 2. Snip off the top and bottom corners to reduce bulk. Turn the top edge of the pocket right side out then fold the sides and bottoms inwards using the stitching line as a guide. They should naturally turn in because of the stitching. Press well. 3. Position the pocket in the middle of the front piece and pin in place. Sew down one side of the pocket, across the bottom and up the other side, keeping very close to the edge. I find it’s best to use a smaller stitch length. Back stitch securely at each end. 4. Fold the ribbon in half and place on the top edge of the front piece, about halfway across. With right sides together, place the back piece face down on top (if you’re using a directional print, make sure both pieces are facing in the same direction!) Pin round the edges so that the ribbon is sandwiched between the fabric. Using a 0.5cm seam allowance, start about 3cm in from the bottom corner and sew all the way round until you’re the same distance from the other corner. Make sure the looped end of the ribbon is out of the way! Back stitch at each end. 5. Snip the corners diagonally then turn the square the right way round, through the gap you’ve just left. Use a chopstick or similar to poke out the corners, then iron the seam down across the gap so that it’s straight. Give the whole cushion a good press. 6. Stuff the cushion until it’s nice and plump, don’t forget to stuff the corners too. Now all you need to do is sew the gap closed, keeping close to the edge and backstitching at each end. You now have a perfect little tooth fairy cushion!